What Happens If The Bond Market Pops? Many of us think the bond market is a bubble, if so when it pops it will leave a massive path of destruction in its wake. Many people have been caught off guard by the collapse of oil prices and the havoc they are causing in many markets. Even more of a concern should be a popping of the bond market bubble. This is a disaster waiting to happen with the general public totally unaware of the ramifications it will have even extending down to reduced pay outs on pensions. Money has been rushing into government bonds in a flight to safety that has sent yields lower and lower. This may be part of a conundrum created by the reality that when you simply have too much freshly printed money floating around people need someplace to stash it. In the world today investors look for large markets to park their money because it implies a degree of liquidity that insures a quick exit if necessary. The idea of money quickly leaving the bond market should be a big concern to all governments. Bonds are not just those issued by America but by countries all around the world. While some forecasters predict America will grow at the fastest pace in a decade during 2015 debt investors are signaling their skepticism as commodities plunge and slowdowns in Europe and Asia threaten the U.S. recovery. Last week, the bond market's outlook for inflation over the next three decades fell below 1.9 percent annually, the lowest in three years. Investors’ expectations for consumer-price increases are diminishing as the Federal Reserve debates how soon to raise its benchmark interest rate which has been held close to zero in an effort to support demand in the economy since 2008. It is hard to know if this is an indicator the marketplace feels comfortable that inflation is going to remain tepid or if concern for safety is driving this market. I contend it is the later and an influx of foreign capital has been driving this market. Anyway you look at it I have a problem lending my hard earned money out for a long period of time based on predictions of future government deficits. These forecast are often formed and made on assumptions based on rosy scenarios or politically skewed to benefit those in power. Knowing what we know about the effect that interest rates have on the value of bonds in the secondary markets, one might deduce that the 30 year bull run on bonds will have to come to an end the moment rates are expected to go up. To give you a sense of what this may mean to U.S. Treasury Bond investors a 10 year treasury bond issued at a 2.82% interest rate could see a 42% loss in value from a mere 3% rise in interest rates. This means if you’d held $100,000 in these bonds prior to the rise in rates, you would only be able to sell those bonds for $58,000 in the secondary market after the 3% rise. Please note the $58,000 you get back would be before factoring in the loss of purchasing value lost from inflation. A theory I have put forth in the past is that it might soon become apparent that storing your wealth in any kind of "paper promise" is a bad idea. The term "liquidity trap" that has been used by Allen Greenspan and others can be difficult to understand. The result of such a trap can be that all the additional money poured into the system, even when coupled with lower rates, can no longer drive the economy forward. This would most likely happen when people realize the return on loaning money is simply not worth the risk! Why do you want to loan money if most likely you will never be repaid or repaid with something that is totally worthless? When this happens the only safe place to store wealth will be in "tangible assets" and the only lenders will be those who print the money that nobody wants. When this happens we are at the end game. Another concept that should be considered is the primary reason that inflation has not raised its ugly head to become a major economic issue is because we as a society are pouring such a large percentage of our wealth into intangible products or goods. This includes currencies. If faith drops in these intangible "promises" and money suddenly flows into tangible goods seeking a safe haven inflation will soar. Like many of those who study the economy I worry about the massive debt being accumulated by governments and the rate that central banks have expanded the money supply. The timetable on which economic events unfold is often quite uneven and this supports the possibility of an inflation scenario. The current subsidizing of the auto, housing, and financial industry coupled with an ad hoc disregard for both the rule of law as well as basic economics produces a very flawed kind of growth. We need to start thinking beyond propping up failed corporations by running up our national debt because this course is unsustainable. Markets are not always efficient and the idea that they are is a myth manufactured by so-called experts such as Paul Krugman in the ivory towers of academia. Disconnected from the real world those responsible with guiding our banking institutions often fail to see potential second and third order effects of debt monetization. In many ways they pose one of the greatest threats to the stability of our economic system. A policy of blindly trusting anyone who claims to be an expert has disaster written all over it. 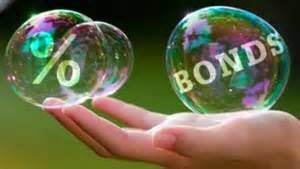 If the bond market is indeed a bubble ready to pop its collapse will be full of ugly ramifications that will not only effect bond holders but will test the economic foundations of both the country and the world. Not only will bond holders be stripped of wealth but soaring interest rates will magnify the nations debt service and rapidly impact our deficit in a negative way. It is important to remember that debts can go unpaid and promises be left unfilled. If this happens where does it leave us? As a contractor and being involved in real estate I was thinking about how "draw systems" work. This has to do with how a certain percentage of the cost of construction is shelled out as each stage of construction is completed. I remember hearing years ago how Home Depot was excited about entering and developing the massive market in China because apartments are sold by the developer at the "roughed in" stage with no interior. You might know Home Depot cut and ran after a few years adding to the list of American companies that failed in China. Home Depot has blamed their bad experience on not understanding the Chinese culture. After reading this article you may question both the quality of how well these housing units have been finished and how many may never get done. In trying to understand the massive housing market that drives much of China's growth it is important to realize that people in China buy apartment units that are only roughed in. This means the buyer is essentially purchasing what we in America would call an "empty shell" or an unfinished apartment. In most cases, apartments are sold with internal walls and electrical outlets in place but everything else, including doors, flooring, and bathroom fixtures will need to be built-out by the owner after purchase. It is understandable this created a great deal of excitement for a company like Home Depot that sells the "rest of the package" in a way that can be a one-stop answer for any home buyer. It cannot be underestimated that most of the money spent on constructing a housing unit is spent in finishing, many people give this little thought. The importance of the housing market in China's economy should not be underestimated, this is where almost 75% of the country's household wealth is stored and it is deeply interwoven with shadow banking. A close look at housing in China and the customs under which deals are completed will give Americans some real surprises. Getting information on this subject is not as easy as we might think in a world where in a blink of the eye we find dozens of articles on America's latest craze, after about an hour of research I found enough to confirm what I thought. The site I received a good deal of information from and found myself returning to was designed to help foreign teachers moving to China to better understand the internal workings of the country, it was last updated in November 2010 and does not appear to have any other agenda. Unlike property and housing ownership in America and other Western countries, all property in China is simply being leased for a 70-year period. 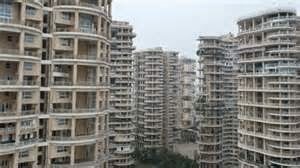 The lease is supposed to renew automatically upon expiration, this might unnerve many buyers that know the Chinese government's relatively new Ministry of Housing and Construction retains full "property prerogatives," meaning that leases can be nullified at any time if the government determines that it needs that property for any reason. In addition, the government is also entirely free to decide how much compensation should be offered for that property in the event the land your apartment happens to be located on is reclaimed by the state. Recent regulations now give residents the right to sue the government if they feel they receive unfair compensation, but they rarely win in court. Then is the issue of cost, it could be said cheap housing is something you won't find in China. Its housing market is among the most expensive in the world when compared to per capita income. For example, the average price of housing in New York City is around $200 per square foot with an average family income of $72,000 per year. By comparison, the average cost of housing in Shanghai for the year 2007 was nearly $108 a sq. ft. against an average family income of $7,316. Generally speaking, the cost of housing outside of Beijing, Shanghai, and Guangzhou will run anywhere from 1,500 to 5,000 yuan (roughly $20 to $68) a foot depending on location. By American standards apartments are small, no more than 30 percent of all new apartments can be larger than 90 square meters (970 square feet). There is a big question and much disagreement over the stability of China's housing market. Shortly following the end of the 2008 summer Olympic Games, the housing market in China fell into an unprecedented slump with housing prices dropping as much as 30 percent below pre-game prices (note this was around the time the world was in economic crisis). Aside from this being a very difficult market in which to predict prices, foreigners may only purchase apartments to live in for personal use and not to rent out. Virtually no secondary market exists to sell into if you decide to relocate. When the Chinese seek to buy an apartment, they will not give much consideration to anything but new construction. Most bizarre is the legal protections and real estate standards are not yet well-established. The various procedures and steps Americans take for granted when purchasing a property such as; due diligence, housing inspections, and secure escrow accounts simply do not exist. China is a land where rules affecting value can change with little notice, good luck with that. Footnote; As always comments are welcome and encouraged. This article goes hand in hand with several others on China the link below will take you to one of the most popular. AS A BONUS! Below is the "Unbelievable story of how they sell apartments or should I say houses in China." It is worth the read, a short lead-in is provided to soften the transition. A week after these people got a number they went to "the lottery." As soon as we got there, they slapped a VIP sticker on them. Some were red; some, blue. The entrance was guarded by men in black swat team attire, complete with Nazi styled helmets and dark glasses. You couldn't get in without the proper paperwork and ID card. It was a challenge to get all of the people in. The American and world economy is in uncharted water. Weird crosscurrents are clouding our economic future. Last quarter America's GDP came in at a strong 3.5% but the fact that a 10% jump in federal spending, mostly on Pentagon hardware bolstered growth and was very much behind the numbers. This "pre-election" spending was the biggest increase in federal spending since 2009 when the Obama administration put in place a huge economic stimulus package. Mix in an upbeat November number concerning job creation, falling oil prices and ever higher stock market prices and new record highs and many people have the impression we are on a roll. The fact is we have created a "Government Centered Economy" and the newly elected Republicans controlled Congress will have power over the purse stings and government spending. It appears they now sit in the drivers seat and they should by all logic slam the brakes on the destructive policies that have distorted the economy and driven stocks to record highs, but why would they want to take on the hard task of bringing about painful reform? What a tangled web we weave, it is hard to deny that the economy is a manipulated mess propped up by government spending and artificially low interest rates that hurt savers. Politicians never want to be the ones to take away the punch bowl and be blamed for ruining the party, this means expect little help from Washington..
We should understand that demand is the true driver of economic growth and investment, it is not confidence. Lack of real growth is about lack of real demand, and much of the demand we see today comes from artificially low interest rates and QE that distorts the markets. Not only do low interest rates punish savers, but when rates are held at an artificially low level for too long capital is misallocated and flows into speculative investments. All growth is not created equal, quality does matter, we must differentiate the kinds of economic growth and understand that if you spend money but afterwards have little to show for it you have wasted it. Sadly, much of the money America "invests in itself" each year through government spending and programs falls into this category. Several other acts are playing out on the economic stage adding to the confusion. World growth is slowing while countries remain mired in debt, this is making the dollar stronger in relation to the other major currencies. This will not help American exporters as month after month we suffer huge and unsustainable trade deficits. When coupled with huge government budget deficits the trade deficits move America in the direction of bankruptcy. It is a myth that we can "export" our way out of this mess, a myth spread by politicians preaching the "no pain" method of solving a problem. Another problem is that the good news to consumers of oil prices falling across the world are adding to destabilizing many countries and disrupting a major growth sector of the American economy. Energy production has been a big job creator for America but lower prices threaten to make drilling unprofitable and stop it dead in its tracks. Adding to our woes job creation and wage growth has been weak compared to all other post recession periods. Recent Black Friday sales were dismal at best and unenthusiastic consumers suffering from years of poor wage growth and in a protracted state of weakness are unlikely to bail retailers out this season. We have seen a big shift in what consumers are buying, recently they have been spending more on autos and healthcare, but the Obamacare mandate may be guilty of creating stress in other sectors of the economy by redirecting spending away from them. Booming auto sales driven by low cost and sub-prime loans may do the same when payments come due. Many of these sales may be motivated because an automobile owner faced with a costly repair may be oping for this alternative verses putting money they do not have into their current ride. This allows someone in a weak financial position, such as those living on disability or student loans, to kick the can down the road while putting themselves into an ego boosting vehicle that they cannot really afford. In many ways Bernanke and the Fed have put America on a path that mirrors the same unsuccessful path taken by Japan. A path that avoids real reform and bails out the very people that caused many of our problems. The Fed then upped the ante by setting the bailout and money printing machines on high and flooding America and the world with QE. By selling other central bankers on this solution the Fed now led by Janet Yellen has taken the lead in an experiment that is losing traction across the world. Real momentum seems to ebb shortly after each new wave of stimulus and another fix seems to constantly be needed. While they claim otherwise any thought that inflation is not higher has come from the false illusion brought from a very competitive retail environment and lower payments on auto loans and mortgages. This is a one off and will not continue. Trouble lurks ahead because debt does matter and it will massively thwart growth going forward. If I'm correct, much of the idea of "so called pent up demand" in our economy is secondary and we are being pushed along by cheap money that is unsustainable. Interestingly, this is all occurring at a time the government continues to pour out billions of dollars each month in student loans, many of these loans will never be repaid. This is in a way its own "stimulus" package. It is hard to predict the future and often we are very surprised how events unfold, expect the unexpected. Remember that great forces are at work here and things are moving rapidly. The currency players and the carry trade is in constant flux. This is not a well rehearsed performance but rather a play it by the seat of your pants and this improvised effort to keep many balls in the air while the ground shifts under our feet. If these balls begin to drop things can go very badly in the blink of an eye. Footnote; As always comments are welcome and encouraged. This article goes hand in hand with the article below that focuses on the destabilizing effects of falling oil prices. A news story on my local news channel in November 2014 reported how a man faced charges stemming from Halloween party. 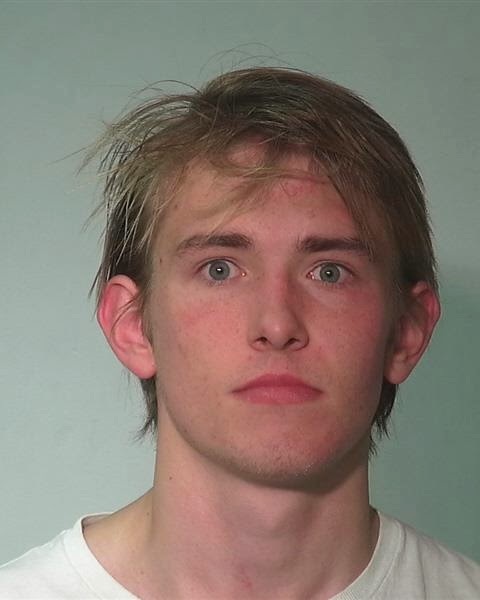 It told how Fort Wayne, Indiana prosecutors have charged a white 20-year-old man after police say he threatened them when they broke up a party on IPFW’s campus on Halloween night. According to court documents, police responded to a call about a loud party at IPFW’s student housing. While speaking with party-goers, officers noticed a half-empty vodka bottle on the floor. Alcohol is banned at the student housing. Police said when they went into the apartment, Theodore Tamm was loud and refused to cooperate. After putting him in handcuffs and leading him out of the building via an elevator, Tamm reportedly threatened the officer by saying he would beat and kill him. A struggle ensued and the officer used a Taser to subdue Tamm who is now facing charges of resisting resisting law enforcement, criminal mischief, and disorderly conduct. Mug shot of Tamm, provided by the Allen Co. Sheriff's Dept. The issue concerning police using unnecessary force and their attitude towards the public they are paid to serve is not black and while. Following the shooting death of Brown in Ferguson and a much more controversial use of force on a black man in New York where choking contributed to his death we should note abuses are being fostered upon people of every race and gender. Rather than an issue of racism I contend this has more to do with the way the role of the police in society has changed over the last decade. As the world has moved in the direction of becoming overly "politically correct" the police many times have moved in the direction of flexing their muscle in a tight "boys club" where the first code is to protect your brother and ignore his transgressions. Abuse, violence, and unnecessary force is not used only on blacks and other minorities but is also employed on whites, or as I like to call them "people of non-color." In response to the incident above, I was not there and I do not know this young man, so I reserve the right to be wrong, but most likely more than one officer was in the elevator and escorting him from the building. Even if I were alone with this handcuffed young man I would like to think that I could of brought him to the floor and held him down until another officer could arrive to help me. To taser him I consider stepping over the line. It should be noted many of these problems occur away from witnesses and cameras. If police wearing body cameras will help to protect the rights of Americans I think we best get on with equipping them with such. While I'm not a religious man I say, "God bless the good old days when the police might have scolded this young man and told him to go to bed." We should not be mislead by how media is trying to spin the protest sprouting up across America into just being about blacks being abused. The issue spills over into the general demeanor of police and how they interact with society. This is why so many young people and white faces are often seen in the protests voicing both anger and resentment. They understand at any time they might see their lives turned upside down by an officer with an attitude. The expansion of the NSA and the militarization of police forces across America reeks of a growing Orwellian police state that should concern us all. The feeling that many of these officers have they should be held to a different standard and are above the law has become an ugly reality across America. This is especially a problem in conservative or unenlightened areas where special economic incentives are often paid to police as a way to generate income for local government or the police department through fines, confiscation of money or property, and other fees. Enforcement of drunken driving laws and the war against drugs where even the most minor offense results in draconian and harsh penalties highlights just how skewed and warped enforcement has become. The President can moan all he wants about police being too heavy handed towards blacks and minorities, but he shares a great deal of the responsibility for their misconduct. Over the last six years while Obama has been in office the unrelentless trend to add a military component to police forces across the nation has continued to ramp up. Many people see this as the governments way to extend control and power over the masses in case of a civil uprising in the future. More and more we see those paid with our tax dollars driving aggressive macho vehicles and strutting around in black uniforms with a swagger of intimidation. Letting your eyes move around the world you will see similarities in today's images of armor covered police in America with shields lined up in front of military vehicles facing protesters. This is something we thought only happened in fascist or repressive countries. To make matters worse it seems this aggression is spilling over into the personal lives of the police. A September 19th article in the Atlantic reports that studies suggest that domestic abuse and family violence is about three times higher in the law-enforcement community than in the general population. So where's the public outrage? A country shocked by actions of NFL's Ray Rice's actions ought to be even more horrified by studies that say at least 40 percent of police officer families experience domestic violence, in contrast to 10 percent of families in the general population. It found cops "typically handle cases of police family violence informally, often without an official report, and that this 'informal' method is often in direct contradiction to legislative mandates and departmental policies. A white paper in 2003 by the International Association of Chiefs of Police on the subject highlights the law enforcement community's failure to track these cases consistently or rigorously. Several studies dating back into the 1990s or even before confirm this and while all partner abuse is unacceptable, it is especially problematic when domestic abusers are literally the people that society is supposed to call for help. Being a police officer is a job that anyone involved in domestic abuse should be disqualify from because it gives them a lethal weapon, trains them to stalk people without their noticing, and relies on their judgment and discretion to protect the abused against domestic abusers. A few weeks ago I received a phone call in the middle of the night from the alarm company that one of the buildings I own had been broken into. My encounter with the police as the building owner was not good and still haunts me so I can only imagine the amount of disrespect a non building owner might have to endure. Believe it or not I was not one time addressed as sir, or asked for any information as to what areas the alarm system covered, but twice one of the officers referred to me as slick, as in "Well, slick, I think they were after was the hard drive from the computer in the law office." This must have been an attempt to bond with me in some condescending way. What really scared me was he boasted about how he was slated for military training later in the day while lacking to comprehend the so called "crime scene" he was viewing was not the work of a sophisticated criminal, but created by kids who were so inept they had also broken into an office at the far end of the building that was totally empty. A young woman of non-color at another property I own who had a encounter about a week late with the police described them as "idiots with guns." The police mission in America seems to have morphed from "serve and protect" to "fighting a war on crime" to one mixing in elements of maintaining order and searching for a terrorist under every bed. Many child psychologists and about every mother will tell you if you want to make a child more aggressive give them some toy weapons. In the case of adults you will find if they have the toys they will want to use them. When the police allow this same attitude to become mentally entrenched in their mind we are all vulnerable to them overstepping the line while they play out some kind of power game. Most people understand police officers have a tough and difficult job, but while this may be distasteful to some police officers to hear this, "you are being paid by the citizens to do a job." Fear for your safety is not a defense for not doing that job in an irresponsible way, if you find you are afraid to do this job another endeavor would be in order. Bottom-line is that Americans should not have to be afraid of those we pay to protect us. 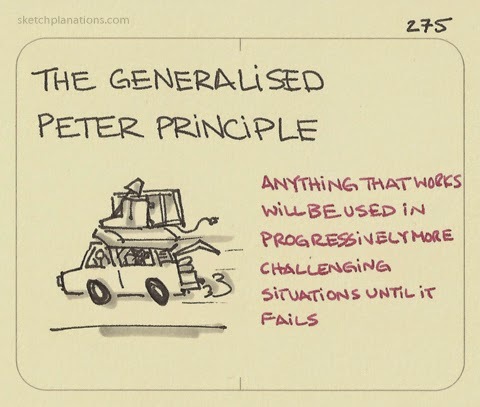 Does The Peter Principle Apply To Mankind? To all the people who think the world's surging population will not become a problem because of new energy sources I say, wake up! Anyone with even the slightest mechanical knowledge will tell you that solar panels, windmills and such take a lot of energy to build and often are maintenance intense. Both these complicated systems have a short lifespan and require a great deal of energy to be expended in just keeping them up and running. This was one of my arguments that optimism concerning ethanol and its potential was being overhyped. By energy expended in the day to day operation of the new systems, I'm talking about BTUs being burned in producing parts, constantly inspecting and replacing parts with short lifespans. At some point, you are not creating enough "net gain" in energy from the total energy produced minus energy expended to claim a major victory in resolving your energy problem.This means the energy we produce in the future will come at a much higher cost. That cost will slow economic growth and remove much of the plentiful bounty we have come to expect and have enjoyed during what I call man's "golden age" or roughly the last 200 years. Carry no illusions the days of cheap energy are behind us and not only has the low-hanging fruit been picked it has been eaten. Sadly, if we look back we will see much of this energy was allowed to go to waste. America has adopted the same attitude towards its buildings. In our fast changing world, we have made everything disposable. A remove and replace mentality tends not to maximize gains or resources and creates a huge amount of waste. Often there is no way to reclaim much of this and even recycling is inefficient. This acceptable lifestyle and way of doing business has extended down to the point where most consumer goods have become non-repairable. With fast growth, we often see a lack of quality. I contend this is about to catch up with modern society. Why should we think that we are immune to the rules governing the universe? When we look at fast growing cities where we see buildings erected and ripped down and replaced after only two or three decades we should ask if this is sustainable or our best use of resources. The reasoning behind remove and replace is often that it is far less expensive to just rip it down than to repair or upgrade a structure with labor being the determining factor. Ironically, this is in a world where the number of people choosing to work is declining and those being supported by government programs has risen dramatically. As the noose of reality and finite resources begins to tighten around the neck of mankind do not expect to hear those in charge to scream out warnings from the rooftops. The few mutterings we hear will be from people tagged as "gloom and doomers" who only see the glass half empty and are incapable of seeing it is really half full. 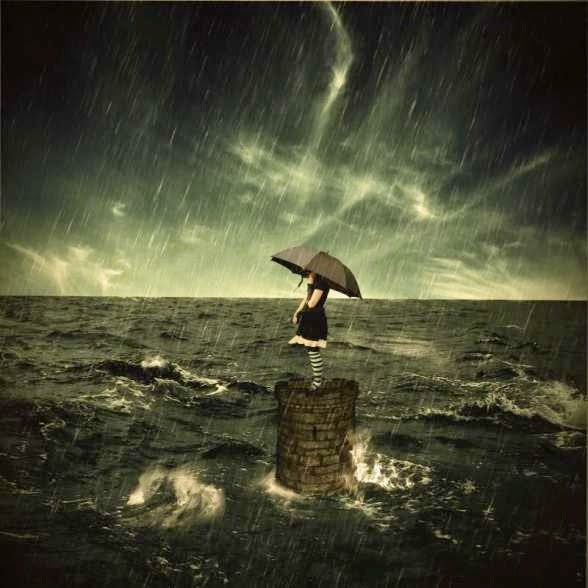 When we approach the tipping point promises of easier, cheaper, and ever better ways of postponing the inevitable will prove to be an illusion. Problems will begin to materialize on a daily basis and reality will be both abrupt and harsh. As I ponder our fate is it possible the collective human race is also governed by the "Peter principle" and if so, how will humanity escape this trap? The Peter Principle is based on the notion that employees will get promoted as long as they are competent, but at some point will fail to get promoted beyond a certain job because it has become too challenging for them. Employees rise to their level of incompetence and stay there. I'm not saying that we can stop going forward or that we should erect barriers to our progress, but it would be wise to give issues more thought. We should ask at what point have we gone as far as we can go before we have sowed the seeds for a less than compelling future? Footnote; As always comments are welcome and encouraged. This article goes hand in hand with another article that focuses on planning and sustainability. You can find that article below. http://brucewilds.blogspot.com/2014/04/planning-sustainable-future-for-mankind.html.